In Virginia a forced sonogram bill in which the state would be permitted to violate women against their will has been stopped. However, here in Texas–despite all the tough talk about intrusive government– such a law is already on the books. “The original Virginia bill that garnered so much national outrage required doctors to perform a sonogram in advance of the abortion, using a transvaginal ultrasound if necessary, to determine the gestational age of the fetus. After originally championing the bill, (Governor) McDonnell walked it back under pressure, working to produce a revised version that assures that women seeking abortions won’t be subject to a vaginal ultrasound. Women will be offered the chance to review the image of the fetus on a belly sonogram, but aren’t required to look at it. In Texas women are at risk from a predatory state government, and from a conservative movement that is always on the prowl for a new conquest in the war against women. Of course the attacks on Texas women don’t stop with the forced sonogram bill. Not content with forced intrusive procedures by order of the state, Republican legislators and Republican statewide officials are moving in for the kill. Texas conservatives say they like small government. Yet they pursue some of the most invasive and intrusive polices imaginable. Texas conservatives say they are “pro-life.” Yet they pursue policies that kill people. Texas Governor Rick Perry will be adding so-called sanctuary city legislation to the ongoing special session of the Texas legislature. Will this bill go after Texas business owners who hire undocumented persons? What penalty will there be for average Texans who have taken advantage of the cheap labor and services offered by undocumented persons? There will be none of that you can wager. What we will have instead is the bullying of the weakest amongst us that seems an essential part of the character of the Texas conservative. This legislative session has been all about diminishing the lives of Texas children and of the poor in Texas. What we now have as well is the expansion of police state powers with Americans citizens subject to questioning on the basis of skin color. Such an expansion of the powers of the State of Texas would be consistent with the recent enactment of the forced sonogram bill. The forced sonogram bill mandates that women getting a legal abortion in Texas must also receive a sonogram and, also, be forced to listen to details of the results of the sonogram. In Texas it will soon be okay for the state to force unwanted medical procedures on free citizens. Just imagine the libertarian and right-wing screaming if Democrats forced unwanted medical procedures on American citizens. After passage of a sanctuary city bill, it may well become legal for the state to demand the papers of American citizens for no more reason than a hunch or a guess. This sure is some small government for you. It seems that any public policy, no matter how intrusive, is okay if it suits the ideological extremism of Governor Perry and the Texas Republican Party. At the end of this post is weekly Texas Progressive Alliance Round-up. The TPA is a confederation of the best political bloggers in Texas. TPA members are citizen-bloggers who are working hard for a better Texas. With the round-up this week is a reminder that former Republican Texas Governor Bill Clements, who died last week, signed a $5.8 billion tax bill in his second term as Governor to fund public education in Texas. That action stands in sharp contrast to the current Republican-dominated Texas legislature which has not only gutted public education funding for the next two years, but that is also working to change the funding formula so that Texas education remains underfunded for years to come. Here is an obituary for Governor Clements. My own view is that Republican intent is starve Texas public schools to the extent politically possible because of an ideological opposition to the very idea of public schools. This opposition is part of the shift of the Republican Party in Texas, and of the Republican Party in the nation as a whole, ever more to the extreme right. Here is a report from the Abilene Reporter-News about the sharp cuts in education funding on the way for this part of our state. If folks in Abilene and in communities near Abilene think their kids will be able to get into good colleges and will be able to compete in the global economy with even fewer resources than they have now—Than more power to everybody involved. Republicans in the Texas legislature will do what their ideology compels them to do, and then it will all go to the courts. We’ll see how it all turns out and we’ll see how many students and teachers will get hurt along the way. Off the Kuff suggests that maybe a Rick Perry presidential campaign might not be such a bad thing after all. The demise of the ‘sanctuary cities’ bill in the closing days of the Texas Legislature’s 82nd session represents a “strategic victory” for Rick Perry, according to Mark Jones at Rice University’s James A. Baker III Institute for Public Policy. PDiddie at Brains and Eggs also notes, in other news, that a Blue Angels-like formation of flying pigs is circling the state capital. CouldBeTrue of South Texas Chisme wants to know why Bill Gates is helping Republicans destroy our public education system. Could it be all of that potential revenue from computerized curricula? I appreciate Texas State Senator Wendy Davis of Fort Worth holding up the terrible school finance bill last Sunday night. However, the real work of freedom and the real force for a better Texas will come from average everyday Texans who are willing to vote and work for a more hopeful future. Here are some details of the Texas Legislative special session that is in the works after the Sunday night filibuster. In Wisconsin, people occupied the State House and fought hard against the anti-worker legislation the Republicans were proposing. One state senator can’t do the work of an entire state. Every Texan has the ability to attend a public meeting, attend or organize a protest, write or call an elected official, talk to friends and family, start a blog, donate money, write a letter to the editor, volunteer for candidates and causes you value, and even run for public office. It is up to each of us to do the work of freedom and fair play for all. At the end of this post is the weekly Texas Progressive Alliance round-up. The TPA is a confederation of the best politcal bloggers in Texas. TPA members are citizen-bloggers who are working for a better Texas. 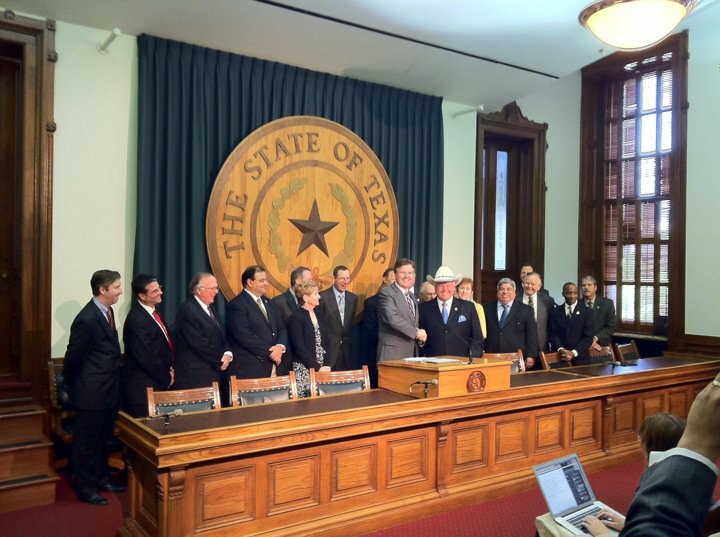 With the round-up this week comes the news that the Texas Legislature has passed a state budget. While those in charge try to defend the budget with false assertions that public education received slightly greater funding in this budget than the prior biennial budget, for the first time student population growth has not been funded. Defending the budget through slippery wording and fuzzy math, as Perry and Dewhurst have done, will do nothing to erase the harmful consequences of these cuts on Texas schoolchildren. Texans can decide what they think about all this. Republicans and the so-called Tea Party can go on and on about waste and illegal immigrants using up public services. My guess is that many people across the political spectrum in Texas have concerns about education and health in our state, and have concerns about how young people in Texas will compete in a changing economy. The impact of this budget will be felt in many ways over the next two years. If the 2013 legislative session will be one that works to help Texans—or is one that once again attacks working Texans and engages in culutral warfare such as the forced sonogram bill—is up to each of us as Texans. The Lege reached a budget deal on Friday. Off the Kuff explains why it is a bad deal for Texas. WCNews at Eye On Williamson, in stating that “… by and large, Republicans aren’t as racist as they are greedy” makes the point that we must adopt a new form of populism in Texas. 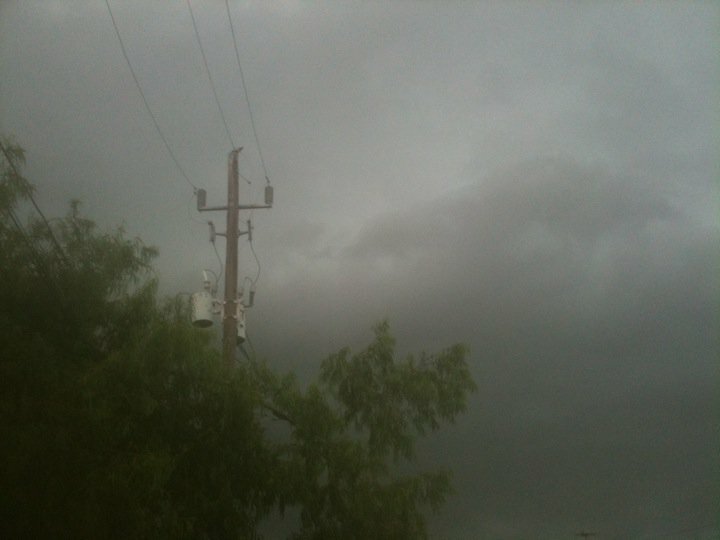 Above is a picture I took of the clouds as the storms approached in the middle of the afternoon. I don’t have a picture from when it was very gusty and raining heavily. Though since this post is predicated on metaphor, I think the dark clouds in the picture suggest enough to let your imagination do the rest of the work. The Texas Progressive Alliance — a confederation of the best politcal bloggers in Texas — has released a preliminary tally of school district job cuts and mass resignations in just 60 school districts in Texas. This is a work in progress. There are likely many more jobs that have been eliminated since January than those represented below. If you know of other ISD layoffs, job cuts, etc. that are not listed here, please leave a comment. AUSTIN—More than 12,000 Texas public school teachers, librarians, administrators, and support staff have left their school job in the roughly three months since the Texas Legislature released proposed budget figures for the 2012-2013 biennium, according to data released Tuesday by the Texas Progressive Alliance. “There is no bunk in these numbers,” said Vince Leibowitz, chair of the Alliance, a group of progressive online activists including more than 50 netroots activists, bloggers, and online writers from across Texas. “These numbers are the cold, hard, truth and show precisely how significant an impact the proposed budget is already having on school districts across the state,” Leibowitz said. More alarming, he noted, is that the more than 12,000 layoffs, firings, and voluntary or forced retirements represent only a fraction of the devastating toll the proposed budget is taking on public education. “These reductions come from a grand total of 60 of the state’s 1,234 school districts, less than five percent of all school districts statewide,” he noted. “Imagine how high this number will be when data is collected for all of these school districts,” he continued. The Alliance collected the data from publicly available sources including newspapers, television stations, and other media outlets that cover Texas school boards. The data was compiled by members of the Alliance and includes districts from all parts of the state. The data was released on the heels of an announcement by the Texas Legislative Budget Board that the proposed budget being considered by the Legislature will be the first since at least 1984 that does not adequately fund public school formula funding and makes no allowance for enrollment growth. “Yesterday, Senator Ogden was quoted as saying that Texas school districts could ‘live with,’ five percent cuts,” said Charles Kuffner, Vice Chair of the Alliance. “Evidently, Senator Ogden and Republicans in the Legislature, Governor Perry, and our state leadership think losing 12,000 public school employees, increasing class sizes, and reducing the quality of instruction are worth living with. We do not,” Kuffner stated. The Alliance will continue to track school district layoffs through the start of the 2011-2012 school year and today will ask readers of their blog to help them track this critically important number in ISDs across the state. The Texas forced sonogram bill is on the way to Governor Rick Perry’s desk. The Governor intends to sign the bill. Senator Patrick is the gentleman shaking hands with the fellow in the white hat. I count 15 men and 2 women in that picture. Those are some of the people responsible for the fact that in Texas the state government will soon force some women to undergo unwanted highly invasive medical procedures. If the state can force one medical procedure on free citizens, why can’t it force any medical procedure on free citizens? Yet the same people turn around and say it is wrong to compel people to buy health insurance as part of health care reform. In Texas, “Choose life” appears to mean choose a crappy life with no health insurance, no social security, no steady work, and no quality education. Will women who refuse the sonograms be arrested? Will they be in some way forced to get the sonogram? Will doctors be forced to detail patient conversations in order to prosecute women who refuse to comply? This is how the State of Texas defines small government and personal freedom. The good news is that we all have the ability to fight back and win. Please consider giving to the lobbying arm of Planned Parenthood. You can do so at the national level or where you live. Here is some information about what Planned Parenthood does in Texas. Planned Parenthood provides many vital health services for women in Texas. There are always things you can do to make progress. Don’t leave the work of freedom to others. Others don’t always do a very good job with freedom. Especially in Texas. At the end of this post you’ll find the current Texas Progressive Alliance round-up. The TPA is a confederation of the best political bloggers in Texas. With the round-up this week, I’m passing on the news that the Republican-controlled Ways and Means committee of the Texas House of Representatives has okayed a tax break for the purchase of yachts. Beyond what this proposal says about some yacht owners, the Florida legislature, Rep. Davis, and our nation as a whole, let’s say that giving a tax break to yacht buyers really would spur some minor amount of economic activity and jobs here in Texas. I’m not conceding that point—But let’s just say. Wouldn’t better educating our kids, providing greater resources for public health, and avoiding the public sector layoffs we are seeing in Texas also be good for our state? Wouldn’t these things create economic benefits and jobs in Texas? Yet our state legislature seems intent on attacking the most important aspects of our future in Texas in the current budget debate. Let’s take teacher layoffs in Texas. Rather than maybe or maybe not keeping people employed in such a round-about way with tax breaks for the purchase of yachts, why not take the funds that will be lost from the yacht tax break and put those funds towards retaining teachers who would otherwise be terminated? Or, instead, maybe we could just have tax breaks for the purchase of yachts. The long range plan to kill public education is reaching the end game. Over a tTexasKaos, lightseeker talks about seeing one of the (unintentional) moving parts at a public lecture given by one of the premier charter schools in the nation. Check out Educational Reform and Our Common Peril! Bay Area Houston has the latest on state representative Larry Taylor’s emergency surgery. What conservatives believe to be true ranks far above what is actually true,and even what is demonstrably true according to science and mathematics. PDiddie at Brains and Eggs points out that this why Rick Perry declares Easter weekend as ‘Days of Prayer for Rain in Texas’, and why John Cornyn “isn’t so sure” that Jon Kyl was wrong when he claimed that abortions were 90% of Planned Parenthood’s budget. It should consequently be no surprise that they place no value in teachers and education. Students in the Katy Independent School District–located here in the Houston-area–walked out of class Thursday afternoon to protest sharp public education cuts being planned in the Texas Legislature. Good for these young people. It is up to each individual to do the work of freedom and democracy. Individuals must make the call to work together for a better society. Let the example these students have set be a lesson to all people that we can always fight for what is right. Now what these students can do is go home and ask their parents if they voted for Republican Governor Rick Perry, and for the Republican legislators who are enacting these cuts in our state legislature in Austin. They can ask their parents if they voted at all in 2010. And when you vote for Republicans in Texas, what you get are drastic cuts to education funding. 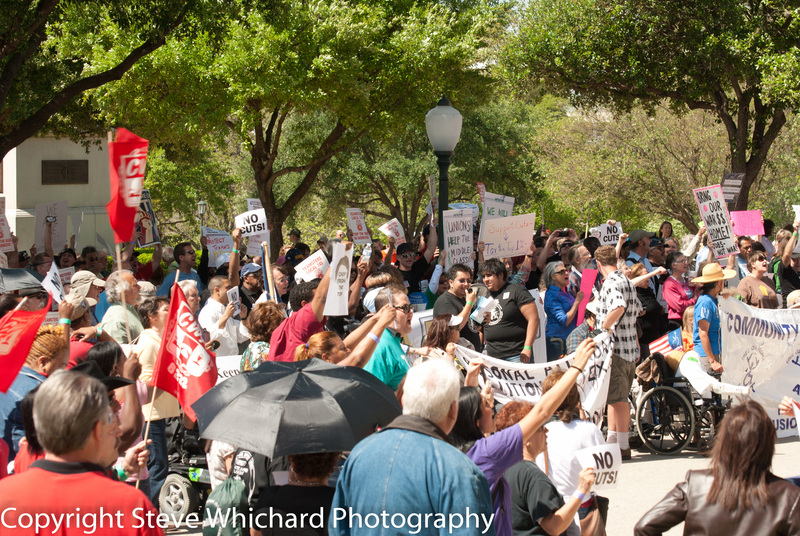 The photo above is from a rally held at our Texas State Capitol yesterday. Thousands of concerned Texans marched to oppose the brutal State of Texas budget being considered by the Texas Legislature. The Texas budget is in a shortfall because of the recession, and because of poor tax policy and public policy decisions made in recent years by the Republican-controlled legislature and by Governor Rick Perry. Republican State Senator Steve Ogden, Chair of the Senate Finance Committee, admits that Republican fiscal policy in Austin has been a significant cause of the current shortfall. The marchers at the Capitol yesterday voiced a number of concerns that are of relevance to all Texans. It is always the right day to fight back. It is always the right day to make your case before the public. It is always the right day to be hopeful and to move forward. Texas is better than what the Republican supermajority in Austin is planning for our state. We care more about each other than Rick Perry imagines we do. When Will Harris County Judge Ed Emmett Show The Leadership He Is Asking Of Others? Republican Harris County Judge Ed Emmett hopes Republican legislators in Austin will do they right thing in the face of drastic cuts to vital services that are on the way in Texas. We can all hope for the things, no matter how unlikely, that we wish to see in life. Judge Emmett was speaking about funding cuts the legislature is cooking up for Texas counties. It is unclear what Judge Emmett is really asking of others. Faced with large cuts for the most vulnerable, and for many other essential services in the Harris County budget just recently approved, where has been Mr. Emmett’s own call for increased revenues to meet the legitimate needs of our county? Where is his leadership? If the money is not going to come from Austin, maybe we need higher taxes in Harris County. Does anybody seriously think Harris County is currently over-served by government? Judge Emmett did send one of his top campaign officials to a meeting of a local Tea Party cell last year to reassure them he was on-board with the Tea Party agenda. Mr. Emmett himself did not show up at the Tea Party meeting. You can never quite pin the guy down. Will Judge Emmett be sending another underling to a Tea Party meeting to sell them on the idea of increased revenues for government? 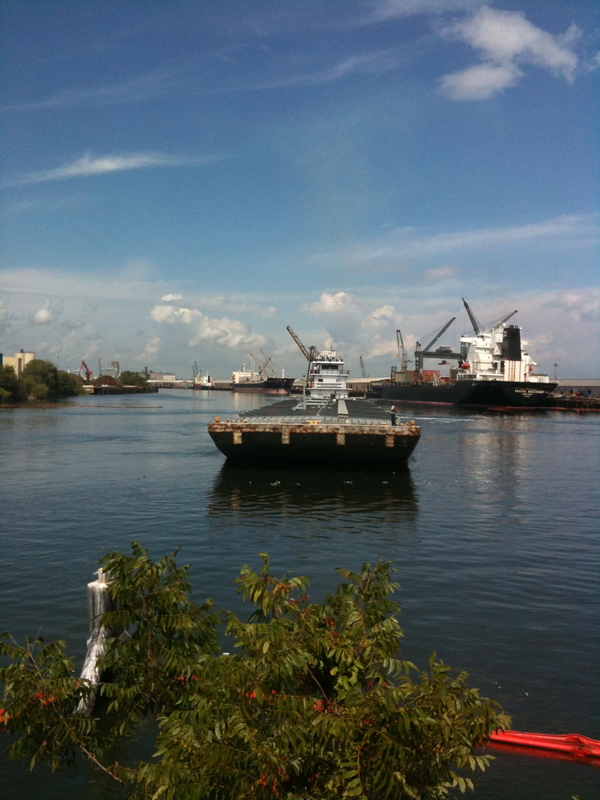 Which Republican legislators in Harris County will Judge Emmett be campaigning against in 2012? I’m glad Judge Emmett is open to discussing the issues before Harris County in a more helpful way than are most Republican officials. Yet given the gravity of what’s taking place now in the legislature, it is time for Judge Emmett to step up beyond being acceptable to enough Republicans and tolerable to enough Democrats, to remain politically popular. It is time for Judge Emmett to show the leadership he is asking of others. At the end of this post is the weekly posting of the Texas Progressive Alliance Round-up. The TPA is a confederation of the best political bloggers in Texas. With the round-up this week is a link to the fifth edition of the Texas On The Brink report. Texas on the Brink details the social, economic, physical, and educational health of Texas. It is produced by the Legislative Study Group. The LSG is a caucus formed by Democrats in the Texas House of Representatives. Houston State Rep. Garnet Coleman is the Chair of the LSG. Mr. Coleman has been a leading voice in our legislature for a Texas that offers opportunity to all. From the 2011 Texas on the Brink report—“Since 1836, Texas has stood as an icon of the American dream. Blessed with land, rivers, oil, and other abundant natural resources, early Texas welcomed everyone from cattle ranchers to braceros, from cotton farmers to Chinese railroad workers. These pioneers built a great state, and together we fulfilled a destiny. From humble beginnings, we built a state with the firm belief that every Texan might rise as high and as far as their spirit, hard work, and talent might carry them. With education and determination every Texan might achieve great success – home ownership, reliable healthcare, safe neighborhoods, and financial prosperity. The report details many things we know about Texas. We know Texas can be a rough place to live. We know some people don’t do well in Texas not because they don’t work hard, but because they are born into circumstances that can be tough to overcome. None of this is to suggest the report lacks value. We need to know specifics so that we can put the right policies in place for the future. The information in Texas on the Brink is essential for this purpose. The only thing this important report lacks are suggestions for what average Texans can do to fight back and to make progress. As our legislature moves forth with planned brutal cuts in health and education, people need to know how they can effectively advocate for a better future for Texas. There is very little progressive infrastructure in our state. Many people are not accustomed to politics and protest. We keep hearing the bad news in Texas. After a time that just wears folks down. What we also need to hear about is who to call, who to e-mail, when to show up and speak out, and when to protest. Even in hard times, progress is always possible. It just that sometimes folks need some help and insight about how to make that progress. This week on Left of College Station Congressman Bill Flores gives talking point answers to softball questions. Also, a look at the Republican attack on birthright citizenship both nationally and in Texas, and how Republicans are undermining Texas’ economic future by cutting education funding today. LoCS also covers the week in headlines. Off the Kuff reads an op-ed about how the budget should be balanced and detects a shift in where the center of the debate is. We all know that brutal cuts in the Texas state budget are on the way. Due to longstanding Republican mismanagement of state finances, we have a massive budget deficit in Texas. These cuts to health and education will cost lives and leave Texas children less able to compete with young people in other parts of the nation and from elsewhere in the world. The leading “health” issue being addressed is legislation that would force some pregnant women to have a sonogram as they engage in a constitutionally-protected medical procedure. If the state can force unwilling people to undergo a specific medical procedure, what is there to stop the state from forcing other medical procedures on free citizens? We have the option of raising taxes or using the $9.4 billion Rainy Day fund to help make up the shortfall. Governor Rick Perry has said many times that Texas will not use the Rainy Day fund. Texas is 43rd in the nation in state tax burden, while at the same time the overall tax burden in our nation is as low as it has been since 1950. People can say they are overtaxed, but they are not. We either have the self-respect to meet the responsibilities of running a decent society, or we can let people suffer and fall behind as we go about our way. In addition to the cuts in vital public services, Governor Perry has now also proposed to eliminate funding for the Texas Historical Commission and the Texas Commission on the Arts. It makes sense that a state that places no value on the future would also place no value on the past. All there is are the current political and ideological aspirations of a far-right Governor and a far-right legislature. The only time history has value is when the State of Texas alters history text books to lie about our past. Real history goes out the door while fake history goes in our textbooks. The revision of history is right up there with forced medical procedures with how a totalitarian state would conduct business. As for the arts, you either feel they have value or you do not. I’m not going to change your mind. People of all kinds have creative talents. Those with the resources to pursue those abilities will be able to go ahead. People who need some help in the form of a Texas Commission on the Arts grant, will have to decide where to go in life where what they have to offer will be valued. The direction of Texas is clear. * Darwinian cuts for the least amongst us. * Government control of the bodies and the medical decisions of women. * Historical indoctrination over historical fact. * Rejection of the arts and of the people who pursue the arts. The people of Texas can decide that this is all okay, or they can decide that the past has meaning and that the future has value.